There are several common queries in frequently asked by people to know about the mobile applications and their developments. Here it is described some of the questions and answers for better understanding about Smartphone applications. Mobile application development is the process to develop applications/games for mobile instruments. The application can be developed on various platforms known as mobile operating system. Apple’s iPhone, Google’s Android, Symbian, Blackberry, Windows are the platforms where applications are developed by application/software developer companies. How Smartphone applications are useful? Mobile is becoming most popular communication and computation device. A small hand held device can perform multitasking of telecommunication, computer data calculation, storage, processing, internet, mailing, chatting, social networking etc. Thus mobile has established a leading rank than other electronics and computational devices like computer, desktop, laptop, tablet PC etc. Small size and powerful application processing have increased the power of mobile many folds. This have inspired the electronics manufacturers and software developers to invest time, money and energy to develop more powerful applications related to business, education, entertainment, game, activities, social networking and all. What is the role of mobile application developer firms? Huge responsibility and workload is there on mobile application developers to develop most effective and custom applications for their client’s business and personal needs. Variety of platforms keep them motivating to develop custom mobile applications for Android, iPhone and other platforms along with to face too many industrial application challenges. Android is the open source mobile platform developed by Google and have got the same importance as Linux operating system for desktop and servers. Developers are more enthusiastic and prominent optimistic for the applications developed in Android. Though android mobile application development will take all the attention from the users. Android is a competitive platform to develop required custom applications like Apple iPhone. This all qualities have made this platform more popular among users and developers. There are thousands of useful applications/games one can find in Droid market place for free and paid. Apple’s iTunes is the Smartphone proprietary platform for Apple iPhone. This platform is adopted well due to its structural developments and lot many features that useful to the developer in better way to define and develop any custom iPhone application. How to select desired mobile applications from Marketplace? Google’s Android and Apple’s iTunes are most competitive, well developed market places flooded with n number of useful applications for business, personal, professional, education and entertainments along with lots of fun games. There are many applications/games are free as well of paid versions. Free applications are also the best earning source for developers through sponsored advertisements or are the demo versions with limited features to taste users and inspire them to go for many more features with paid application. What to do if more than one applications with similar features? If you are confused by watching lot many applications providing the same features and functionalities, how would you select the best one for your customer requirements? This is burning question from many users. The answer is simple. Just make a search on review sites and go through the reviews given by experts, smart users and the users who have already tasted the application and shared their opinion on the site. This will save your time and energy to check the features through download and installation process. Even on marketplaces you can find the reviews and ratings given to each application will be helpful to you in selection of particular application for download. How to approach for mobile application development? 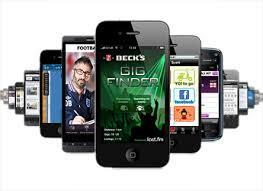 There are many mobile application developers in the Market. Few are the freelancers that can be approached through sites or with local references. If you are looking for professional touch to your custom application with saving your time and energy with the development of application in professional way, you can approach the well proven and reputed mobile application developer firm with good client list and the list of useful application developed by them. Will New iPhone have an Impact on the Mobile Application Industry?